Finding a beehive on your property can be a disconcerting experience. Removing a hive can be difficult, expensive and even painful. Don’t panic just yet, though. Just because you’ve found a beehive does not automatically mean that you have to remove it. Read on, and consider the pros and cons of removal before making up your mind about what to do. If you, a member of your family, or a guest that regularly visits you is allergic to bees, then removal is pretty much a necessity. Bee venom allergies can cause serious medical complications that include swelling of the throat, difficulty breathing, vomiting, diarrhea, difficulty concentrating, passing out and even death. If you are the allergic party, then get somebody else to remove the hive for you. Even if nobody in your family is allergic, bee stings are still painful. Because of this, sometimes the hive sits in an inconvenient location that necessitates its removal. If the beehive is located close to a door or window, then the odds of bees finding their way inside, or swarming on anyone leaving the house, become too high to be ignored. Some types of bees, like the carpenter bee, often build hives inside house walls. These bees bore holes in wood and can cause serious structural damage. These hives need to be removed straight away before they infiltrate too deeply into the walls, increasing the extermination price and even lowering your property value. If you or any member of your family habitually wears perfume, cologne, aftershave or scented deodorant, then you are probably better off removing the hive. Scents like these can confuse bees into thinking that you are a walking floral arrangement. Stings often result from this confusion. Many people raise bees as a hobby. If you raise your own bees then you need to remove any wild hives that you find, so that they don’t crowd your bees out of the picture. If you have a garden then you want to seriously consider keeping the beehive instead of getting rid of it. This holds true whether you have a flower garden or a vegetable garden. Bees pollinate plants. They form an integral part of the lifecycle of most flowers and vegetables. You’ll be doing your garden a great favor by keeping bees close at hand, making it more productive. If the hive is far away from the house, and nobody in your family is allergic, then why bother the bees? They aren’t likely to hurt anyone, and by leaving them alone you are disturbing your local ecosystem as little as possible, and doing the bees a good turn. Besides, leaving them alone saves you time and money. 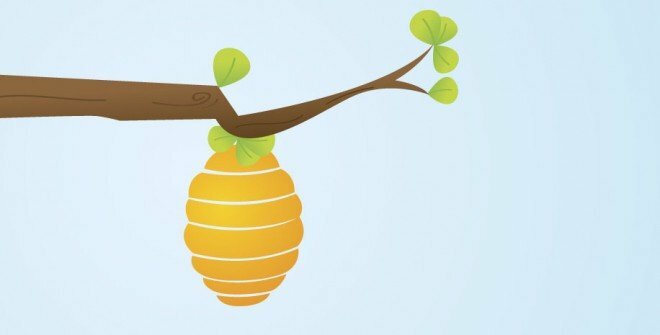 Bees actually produce useful products like honey and wax. Honey is delicious. Free honey is even more delicious. Lots of free honey can even provide you with a little extra income if you sell it. Beeswax makes cheap traditional candles as well as furniture polish. Make your own candles and polish as a hobby or turn their manufacture into a small side business. Mead is a traditional alcoholic beverage made from honey and, sometimes, the honeycombs. Keeping the beehive will provide you with an opportunity to brew a little of this old world refreshment, which goes well with any meal and serves as an excellent conversation piece. Wild bee populations all over the world are in decline. While scientists have no firm idea as to why this is so, they are all agreed on the fact that this decline can put a serious strain on both wild and cultivated plants all over the world. If you leave that wild beehive in place then you are doing your part to keep the environment functioning smoothly. If you are an avid birdwatcher, then you should consider leaving the hive alone. Many unusual and beautiful birds sometimes feed on bees, such as the ruby-throated hummingbird and the olive-sided flycatcher. Keeping the hive in place will help attract these birds to your property.